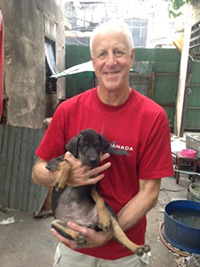 The first dog I brought in Canada was a little black puppy found in a garbage dump. She was covered with ticks. I called the Toronto Humane Society where I was volunteering to ask them if they would accept to intake her. The THS agreed. I called her ‘Rama’ The king of Thailand Dynasty. She was about 2 months old. Then I took her at the vet for treatment, call the quarantine office in Bangkok for info and the Canadian agricultural dept. It was actually very easy! All I needed for Canada was a rabies shot done one month before departure. 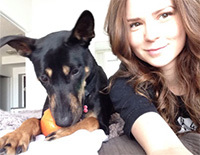 I booked the airline and Puppy ‘’Rama ‘’arrived at the Toronto Humane Society and found a wonderful home!